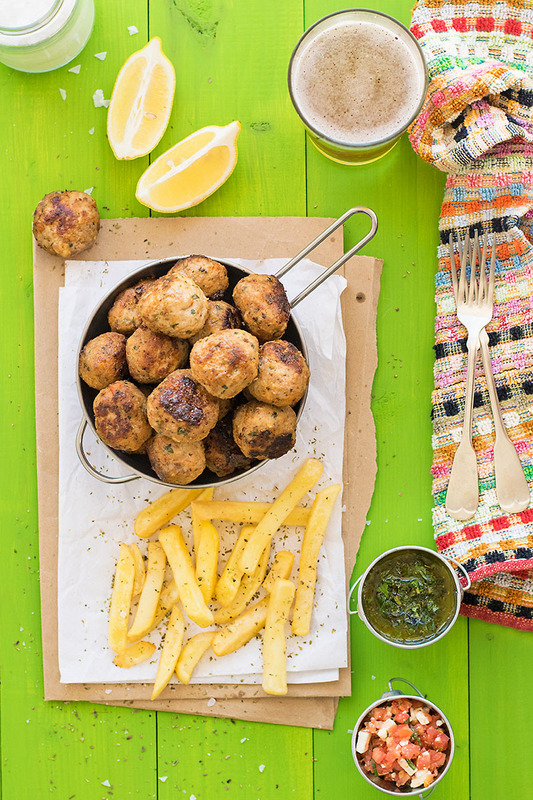 These juicy fried meatballs are Greece’s favorite finger food. With the tomato salsa and the black garlic chimichurri, they’re even better! 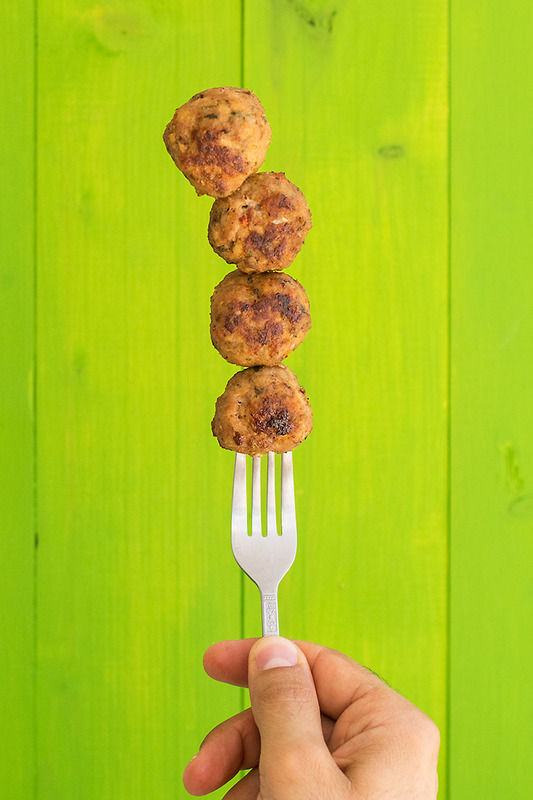 Juicy fried meatballs (keftedes) are probably the most favorite finger food in my country! 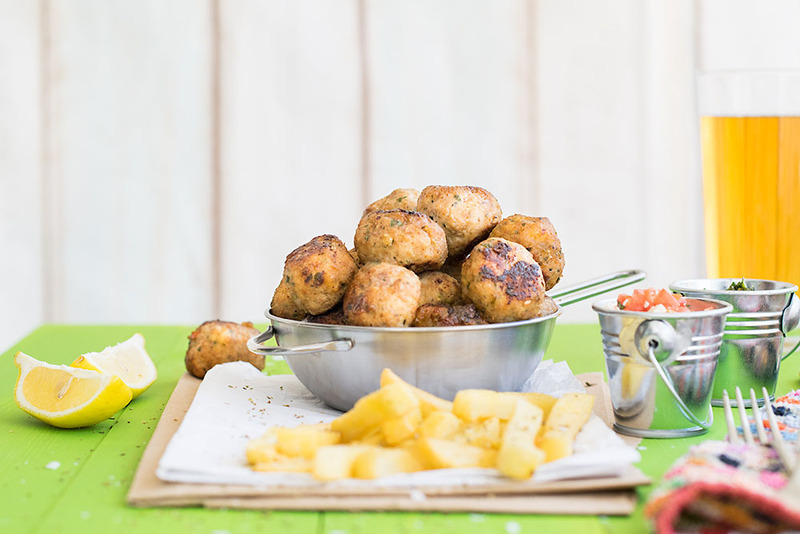 Whether you‘re invited to a party, a simple gathering of friends, or planned a one-day trip in the country for a picnic, fried meatballs are almost always on the menu. And how can they not be? Except the fact that they’re utterly delicious, tender, and juicy, they are very easy to transfer, they can be eaten by hand, and they’re equally tasty warm or at room temperature. I’ve included two salsa recipes to accompany them, one with tomato and feta cheese, and one (tweaked) chimichurri salsa with black garlic. Since my juicy pork skewers (souvlaki) with black garlic tzatziki, I can’t seem to get enough of these amazing black little jewels! 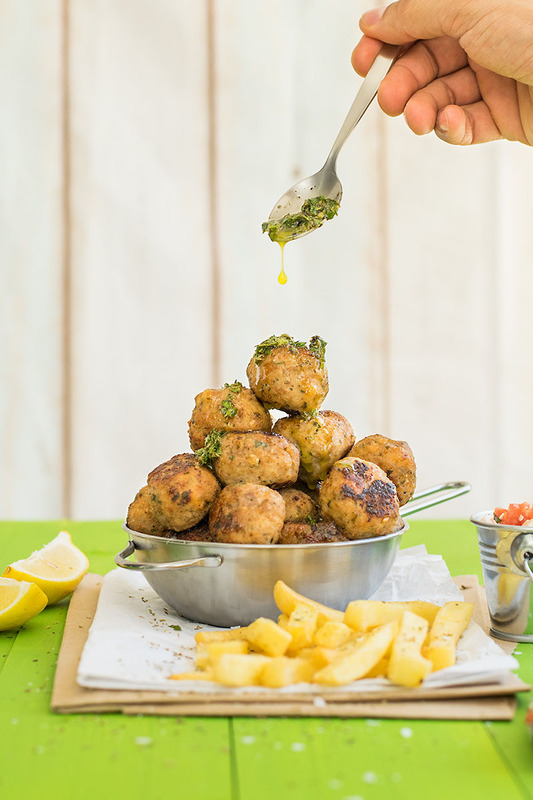 These juicy fried meatballs are so adored by everyone, that most people call them “keftedakia” – which is a diminutive of “keftedes” that express fondness and love. My fondest (meatball) memories are from when I went elementary school and we went on an all-day trip. 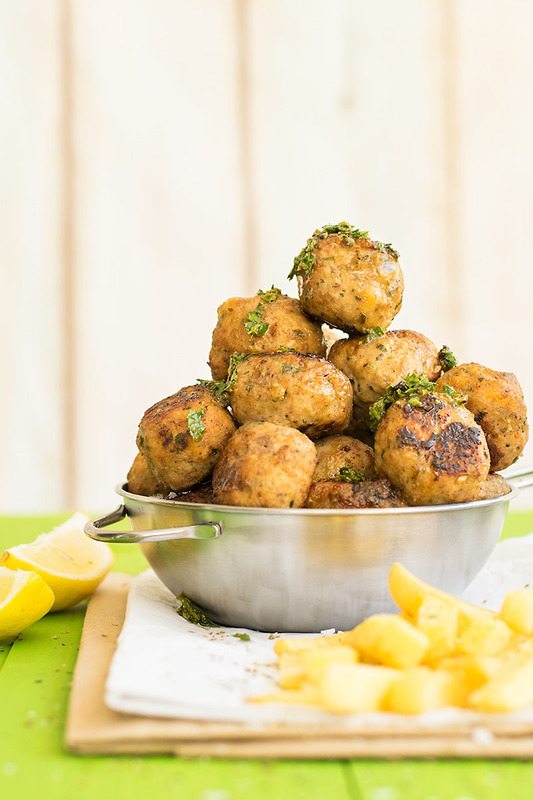 I remember waking up in the morning from the smell of fried meatballs that my mother was cooking in the kitchen, in order to take them with us, as part of our lunch. My brother and I always tried to steal some from the bowl that she kept them, without being spotted, but as life has taught me, there’s not much you can do in my mother’s kitchen without being caught in the act. Of course, my mom didn’t use to make a tomato and feta salsa, or a black garlic chimichurri, but there were times when she made this spicy feta cheese dip with red horn peppers, which is equally delicious! 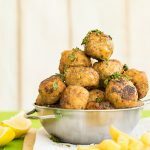 Another thing you have to know about this recipe is that these juicy fried keftedes freeze really well! In fact, I almost always have some in my freezer. When I need something quick and tasty, I just microwave 6-7 meatballs (without thawing them) and with a few slices of bread and a green salad, I have my dinner ready in no time! Now, regarding the preparation I won’t lie to you, they require some time because you have to fry them in batches. First, I thought about baking them instead, but they just wouldn’t be the same! 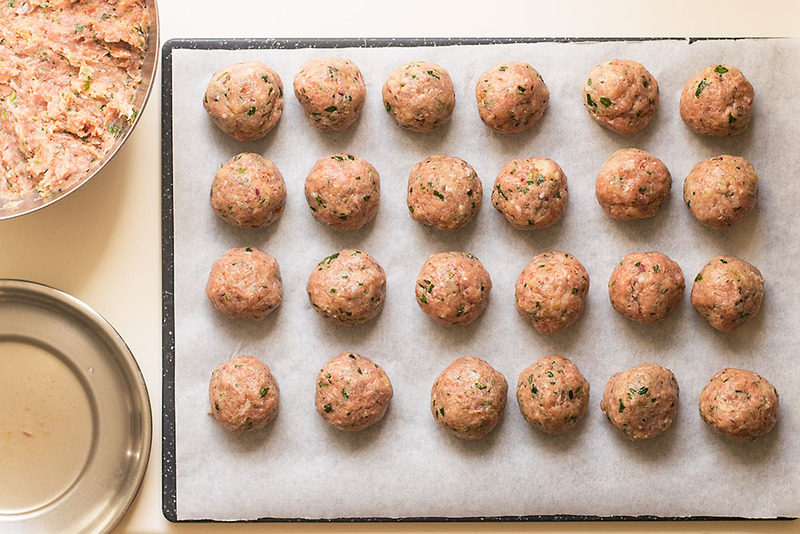 That’s why I give you a rather large recipe (it makes about 45-60 meatballs, the size of a walnut) so you can fry them all at once and freeze the quantity you don’t need for another time. Unless you want to make them for a party, in which case you’ll probably need them all! In order to cook properly, these meatballs are the size of a walnut, about 1.5 inches (4 cm) in diameter. If you make them larger they may be browned on their surface and uncooked in the center. Let the meat mixture rest in the fridge for at least half an hour. It will firm up, and the flavors will develop. These meatballs freeze incredibly well! 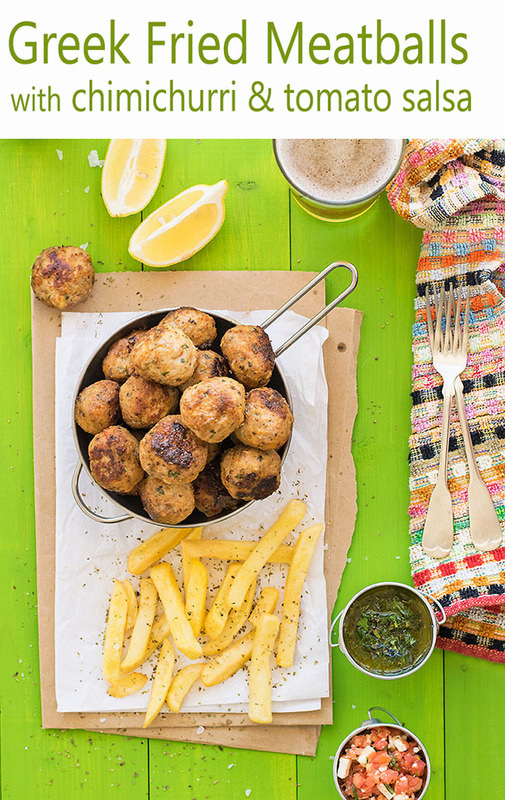 These juicy fried meatballs are Greece’s favorite finger food. With the tomato salsa and the black garlic chimichurri, they're even better! Combine all the ingredients for the meatballs in a large bowl, except the water, and mix well with your hands until homogenized. Start adding the water, one tablespoon at a time, until a soft mixture is formed. You may not need all the water. Store the mixture in the fridge for at least half an hour. Pour the wine or ouzo in a small plate and wet your hands. Take a small quantity of the meat mixture and shape into a 1 1/2 inch ball. 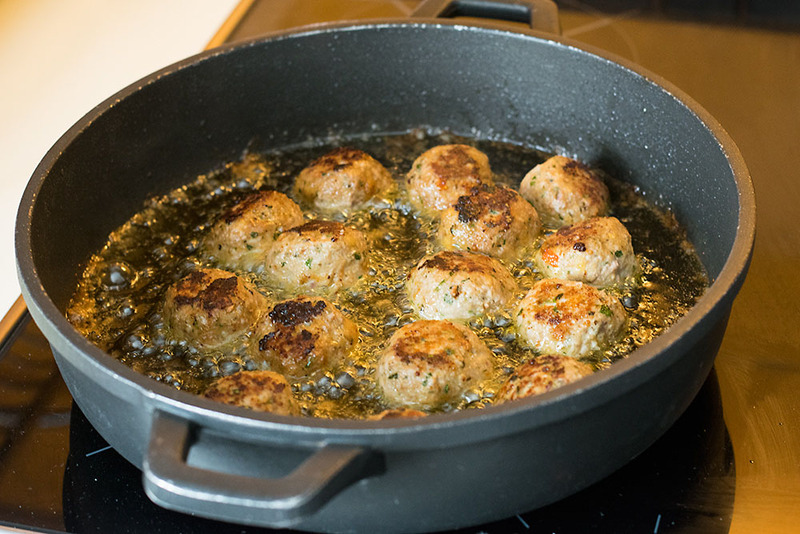 Continue with the rest of the meatballs, each time wetting your hands before shaping. Pour some oil into a large frying pan, about 1 inch high and heat over medium/high temperature. For the tomato and feta salsa transfer all the ingredients in a bowl and mix to combine. Leave in the fridge for one hour for the flavors to develop. For the black garlic chimichurri, shake olive oil and lemon juice in a shaker, add the rest of the ingredients and mix well. Pour into a bowl and leave in the fridge for one hour for the flavors to develop. Serve the Greek fried meatballs with fries, baked potatoes, or fluffy rice. Accompany with the two salsas. These meatballs were so good. I’m Greek and I’ve tried half a dozen recipes for left edges and this is the best one so far. They are juicy and flavorful. I did decide to bake them instead and they were still really good. Can’t wait to make a batch for my next family gathering.